Comfort is influenced by several factors such as air temperature, thermal radiation, humidity, clothing, activity, etc. Radiant heat increases comfort by warming occupants and objects in the room directly. 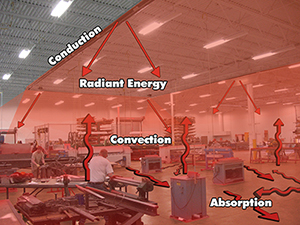 As ROBERTS GORDON® infrared heating equipment warms a space, radiant energy builds in the surrounding surfaces. When that energy is released, the air is heated through convection and re-radiation. This increases the Mean Radiant Temperature (MRT), which is defined as the uniform temperature caused by the combination of heat transfer from objects and radiant energy. Just like direct sunlight, the increased MRT allows occupants to feel comfort at a reduced air temperature. turn your thermostat down 5°F? The goal of heating a space is maintaining the Operative Temperature (To). Defined in ANSI/ASHRAE 55, Operative Temperature is how warm a space feels versus its actual temperature.Due to radiant appliances heating the surfaces directly, the average MRT of the space tends to be higher than the Ambient Air Temperature (Ta). The formula below describes the relationship between To, MRT, and Ta when air movement across occupant level is less than 40 feet per minute. These are working examples that show the relationship between convective and radiant Operative Temperatures for the same application. The above examples show exactly how radiant heat can reduce fuel costs associated with heating a space. Most thermostats measure ambient temperature of air in a space. The necessary Ambient Air Temperature can be reduced due to the higher Mean Radiant Temperature achieved using ROBERTS GORDON® infrared heating equipment. As a result, your thermostat can be set lower while still maintaining the same comfort level.